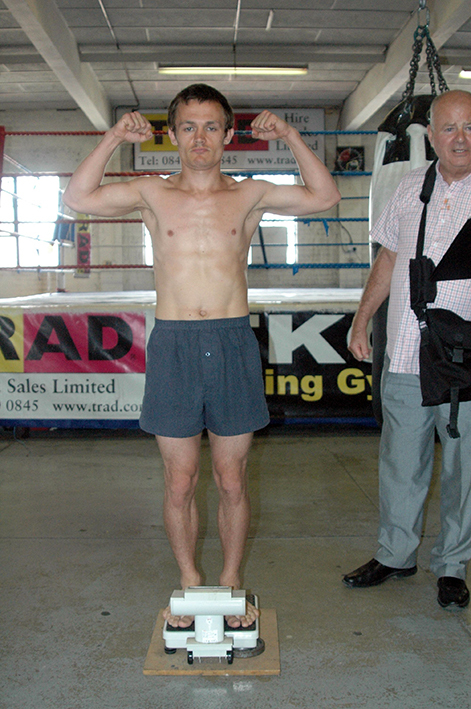 Weights And Quotes From London – Drama As Bailey Fails To Make Weight. 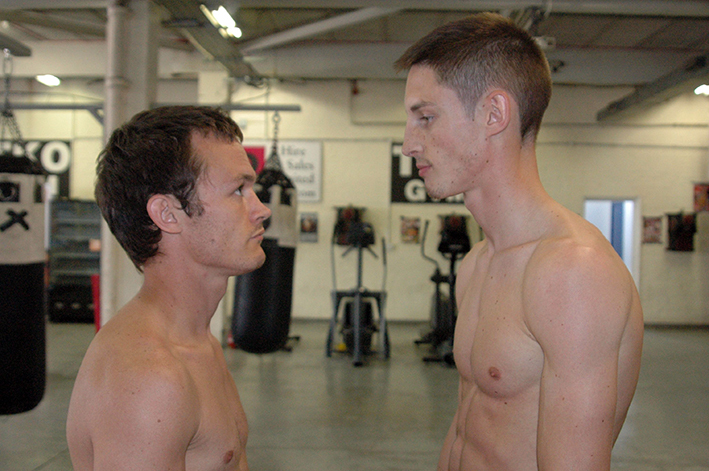 There was drama earlier at the weigh in for tomorrows Southern Area Featherweight Title clash at York Hall in London, between defending Champion Ian Bailey and challenger Dan Naylor, after Bailey failed to make the Championship weight. “Unfortunately it’s my fault, yeah I’ll have to look into that in the future. I now have two options, move up a weight, or get in touch with someone that really knows how to make sure I can make the weight, It’s a science and it’s so important to have someone who knows their stuff. It’s going to be a wicked fight, even though I can’t retain the title. 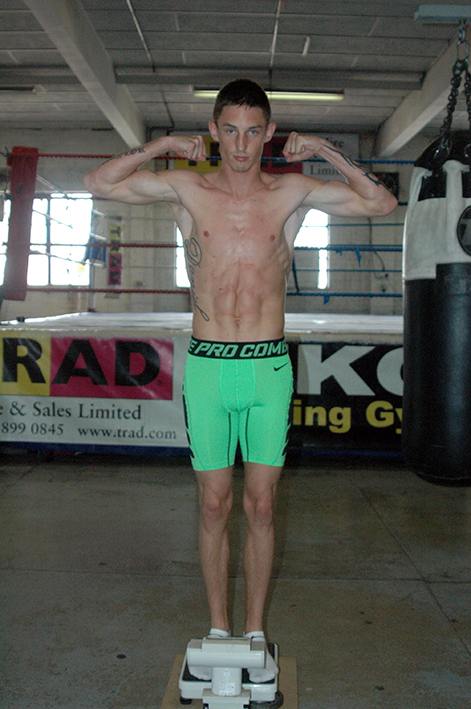 “Yeah bang on, I made sure I did everything properly and am pleased I made the weight, even though I hadn’t fought at Featherweight for a few years, we always knew I could make that weight, so yeah I’m pleased with the result – on the scales. I can win it, obviously he’s failed the weight but it’s still there for me to win. Promoter Johnny Eames then spoke briefly about the fight. “I’m a little bit disappointed Ian hasn’t made the weight, I could have tried to get him to lose the weight, but my decision was not to, so how it is the title fight carries on, but Ian can’t retain the title. It’s down to Dan Naylor to win it, should Ian win then the title becomes vacant. It’s still a good ten rounder. The rest of the undercard is all in place and I’m sure it’ll be a great night of boxing for the fans. The first show was good, this one will be even better. As I said I’m disappointed Ian didn’t make the weight, for whatever reason, but these things happen and I’m pleased that the BBBofC have allowed the fight to still go ahead. Finally I want to put a big thanks out to new partners on the shows, Baz Rahman and his brother Shaz – Baz and Shaz, that sounds like a singing duo, but it’s not – they’ve been a great help and I’m sure with us putting on a great show again they’ll enjoy the night. 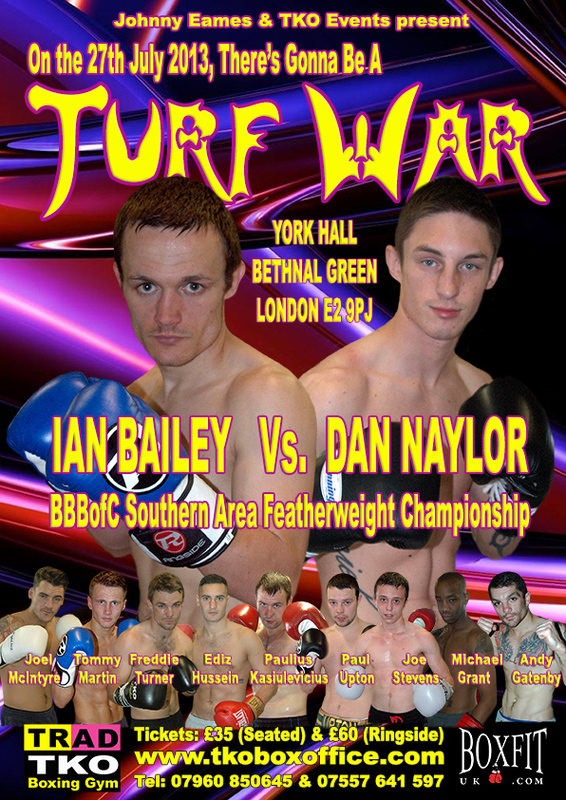 Ian Bailey versus Dan Naylor Southern Area Featherweight title clash headlines the Johnny Eames TRAD TKO Events promoted ‘Turf War’ at York Hall, Bethnal Green, London on Saturday 27th July 2013.